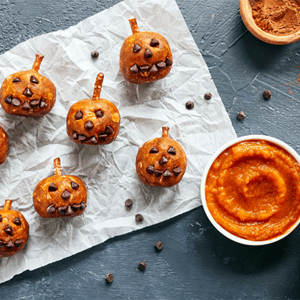 With Halloween around the corner, there’s no shortage of sugary treats – in fact, they seem to already be lurking in everywhere! While the mini candy packages are handy when it comes to portion control, they’re still enough to make your teeth hurt and send your blood sugar surging. 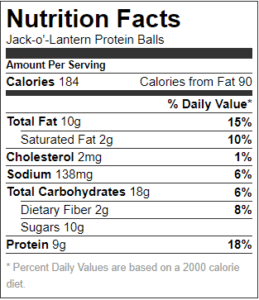 Why not whip up a healthy and festive treat like these Jack-o’-Lantern Protein Balls instead? These protein balls feature a delicious combination of peanut butter, pumpkin, cinnamon, and Vanilla Shakeology. It’s the perfect balance of satisfying protein, with fall flavors to make you swoon. The peanut butter can be swapped for almond butter, cashew butter, or even sunflower seed butter (to make it nut free). And if you happen to have “pumpkin pie spice” on hand for the holidays, you could swap it for the cinnamon. 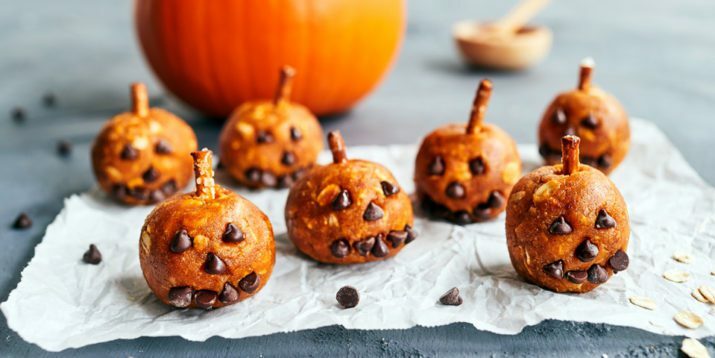 Mini chocolate chips and pretzels transform these treats into mini Jack-o’-Lanterns. If you can’t track down chocolate chips or pretzels, or simply want to skip that step, they’ll still be delicious without them. Combine peanut butter, pumpkin, honey, oats, Shakeology, and cinnamon in a medium bowl; mix well with clean hands or a rubber spatula. 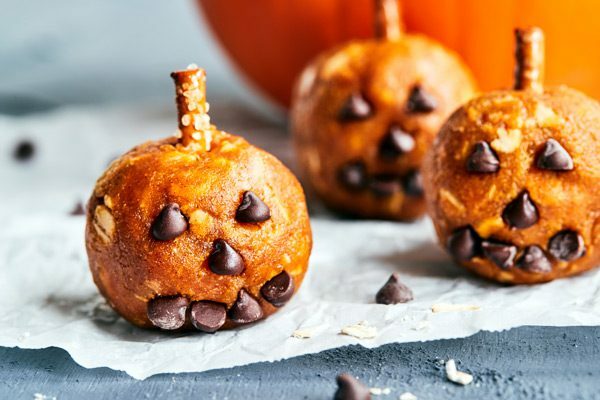 Arrange chocolate chips in protein balls to resemble jack-o'-lantern faces. Stick a pretzel piece into the top of each protein ball to make a stem. Place in airtight container; refrigerate for at least 1 hour before serving.